Using the wrong type of axe to split wood is very inefficient, and you’ll achieve far less with the same amount of effort. In this article, I will go over splitting axes and examine what makes them stand out and which ones you should be keeping an eye out for. Quick tip: Invest in some protective goggles if you plan on splitting wood, as there could be bits and pieces flying around and you don’t want to get any of that in your eyes. 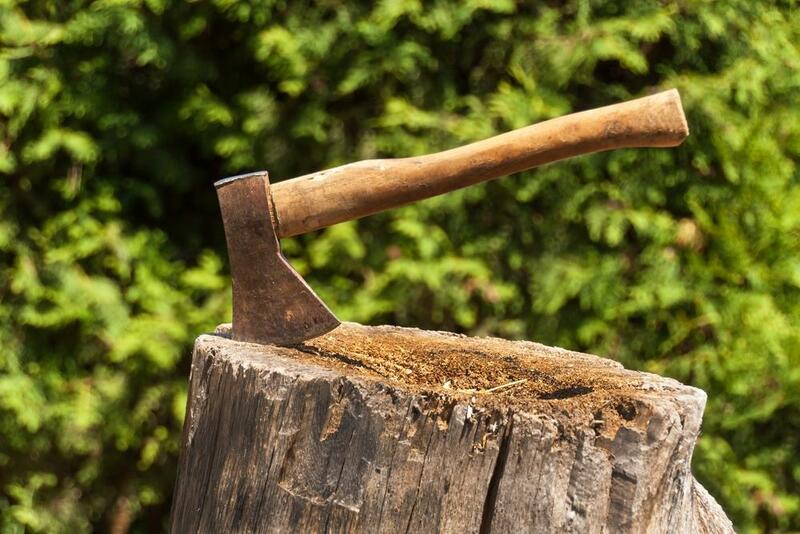 ​What Goes Into a Good Axe? Most likely, you will have two options here; wood and fiberglass. Fiberglass is superior in almost every way, but wood is still used, in part because it’s cheaper. Some users also love the nostalgic element that comes with a simple wooden handle. A handy thing to look out for is grain orientation. As a rule of thumb, the grain of the wooden handle should be aligned with the force that it has to endure. So for the best results, you want the grain to go along the length of the handle. Of all the criteria on this list, length is probably best left to personal preference. 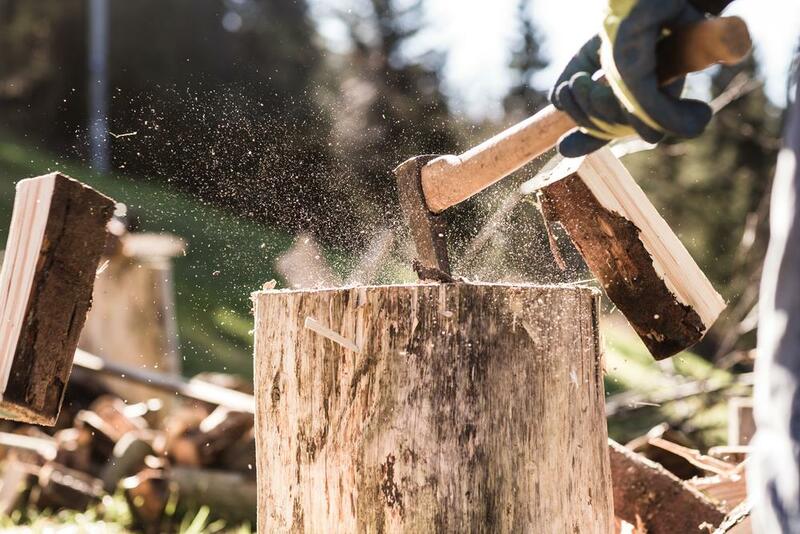 It’s important to make sure that you’re comfortable with your axe, as it makes splitting wood less stressful for the body, so you can be more efficient and avoid feeling sore after work. Longer axes have more forceful swings than shorter ones, but only if you can handle them. Shorter handles are still more than enough to get the job done, and will work better for you if you find them more comfortable. Finding an axe that does more than what you intend to use it for can be difficult, and for some, it could also seem pointless. But let’s compare a splitting axe with a splitting maul. A maul is essentially a sledgehammer with an axe head, which means it’s much heavier but also more effective at splitting larger pieces of wood. So if your axe has some features of a maul, it can easily split all kinds of wood, and you get more bang for your buck. While there are differing opinions on which alloys to use and which tools help improve the axes, most people agree on high-carbon steel (0.6%-1% carbon content) as a safe choice. It also helps a lot if the steel gets appropriate heat treating. Heat treating is a process where the mechanical properties of steel are modified, usually improving things like impact resistance, yield strength or ductility (the ability of the metal to deform under pressure, usually important for making wires). If possible, try to consult your local smith to find out what kind of alloy you should invest in. With all these things in mind, I’ve isolated five great axes so we can compare them and come up with the best possible purchase. 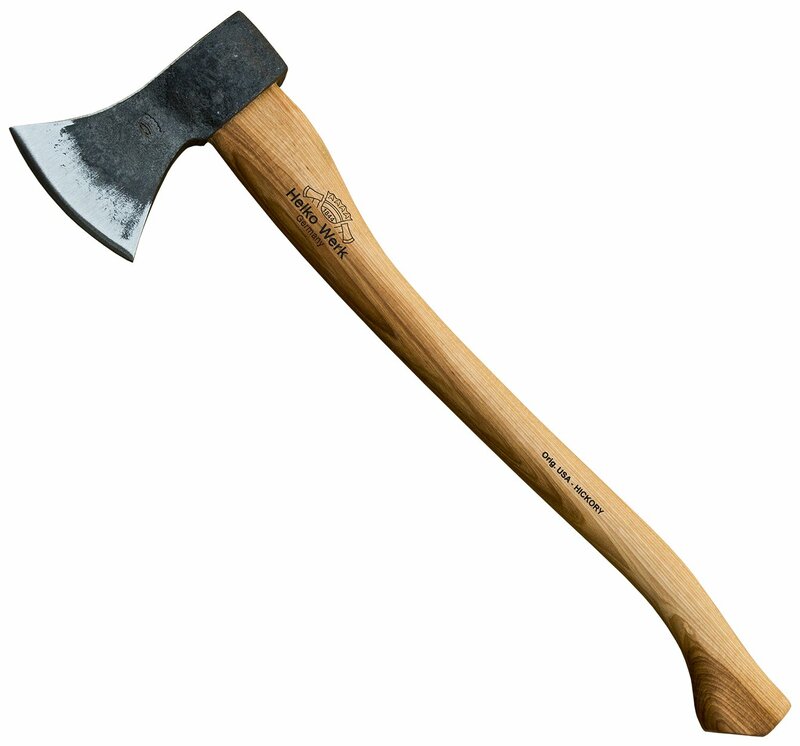 I strongly suggest choosing an axe you physically feel comfortable using, for health reasons. Let’s examine the items! Apart from injuries, there is nothing worse than your tools breaking while you work, especially if you’re trying to earn your salary. The Fiskars X27 helps out by being extremely durable in all conditions except extreme cold (then it becomes a bit brittle). So unless you’re trying to split ice blocks in Antarctica, your axe should be in tip-top shape for a very long time. You have four options when it comes to length: 17 inches, 23.5 inches, 28 inches and 36 inches. The 36-inch variant is very useful for tall people, who normally have a harder time finding tools that work with their height. Most of this axe’s weight goes into the head, which keeps the FiberComp handle light and increases the force of impact where it’s needed. This means you don’t have to put as much momentum behind each swing as you would with some other axes, so you don’t get tired as easily. This Finnish axe is therefore pretty good if you work long hours or you have a huge batch of wood to process at home. Aside from the cold resistance problem, the Fiskars X27 also needs a bit of maintenance to perform at its best. By that I mean, you need to sharpen it frequently and regularly. If you use your axe often, this should become a part of your routine, so don’t look at it as a special annoying task, treat it like washing your hands before eating. This entrant comes from three different countries, in the form of ingredients. The head is made in Germany using top-quality high-carbon steel. It’s definitely on the smaller side, which makes it super easy to carry around/store/pack into your car, though it comes with disadvantages if you want to split huge pieces of wood. The handle (made in Switzerland using strong American hickory) boasts proper grain orientation, and it’s balanced enough to be comfortable even after extended use. It almost feels like you’re chopping meat, as the axe is a powerhouse for its size. The size probably won’t work for you if you’re tall as a basketball player. Some people claim it’s a handy situational tool to have even if it doesn’t end up becoming your primary splitting tool, though, and I can confirm that. It also doesn’t tire you out like you’re mining for coal. The price is nothing to scoff at, but the quality of the materials used justifies it. This one comes with a bottle of Axe-Guard protective oil, so some of the maintenance is made easier, which further increases the convenience it brings. 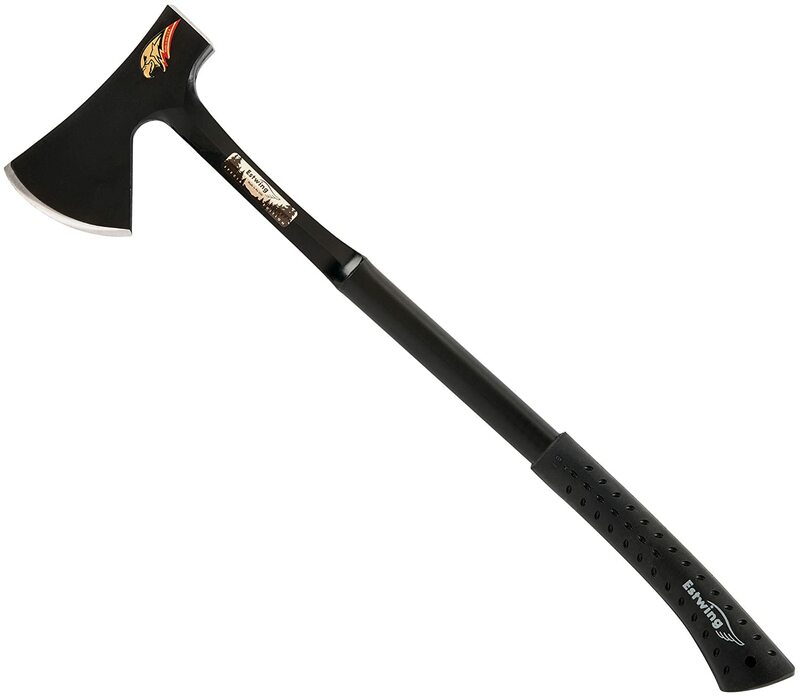 As the name above suggests, this large splitting axe comes with an Estwing-unique shock reduction grip that removes around 60-70% of the shock, making it very comfortable to use. It feels like you’re cutting through empty space, and has that pleasant massage feeling in your hands like you put your palm on a neck massager. The 26-inch handle gives a lot of “oomph” to the axe, and the single-piece steel construction protects it from the elements and increases its longevity. It also means the head can’t come off, which sometimes happens with a lot of other axes (especially lower-quality ones) and is terrifying. It’s less like a Tom’n’Jerry skit and more like an actual massive piece of sharpened metal flying at dangerous speeds. The fact that it cannot happen with the Estwing is therefore very comforting. For all its length, it’s also useful for cutting up branches into firewood. However, the weight and overall length don’t help with storage, and it’s not very practical for just carrying around. It’s a great axe for tall people, but not as good for those of us who don’t need to bend down in doorways. This axe comes with a pretty convenient main selling point; it’s useful for both splitting and felling (using a slightly curved edge), which makes it a versatile purchase that can save you money in the long run. The 25-inch handle is long enough to give the axe a powerful swing and short enough to not be too cumbersome or inconvenient. Good grain orientation on the handle helps the axe live up to its 20-year warranty, so you can pass this thing down to your kids (and hope they don’t play with it) if you want to. It’s a very sharp and balanced axe, so you can use it without significant discomfort, and it doesn’t exhaust you as much as you’d expect from a handle of that length and weight. However, all that quality comes at a price. That price is money, unsurprisingly. While it’s not insanely unaffordable, it’s not an axe you can purchase without serious consideration. However, it costs less than getting two axes for the same two jobs, so if you want to do more than splitting, it’s definitely worth the price. It also comes with a copy of “The Axe Book” and a protective sheath. 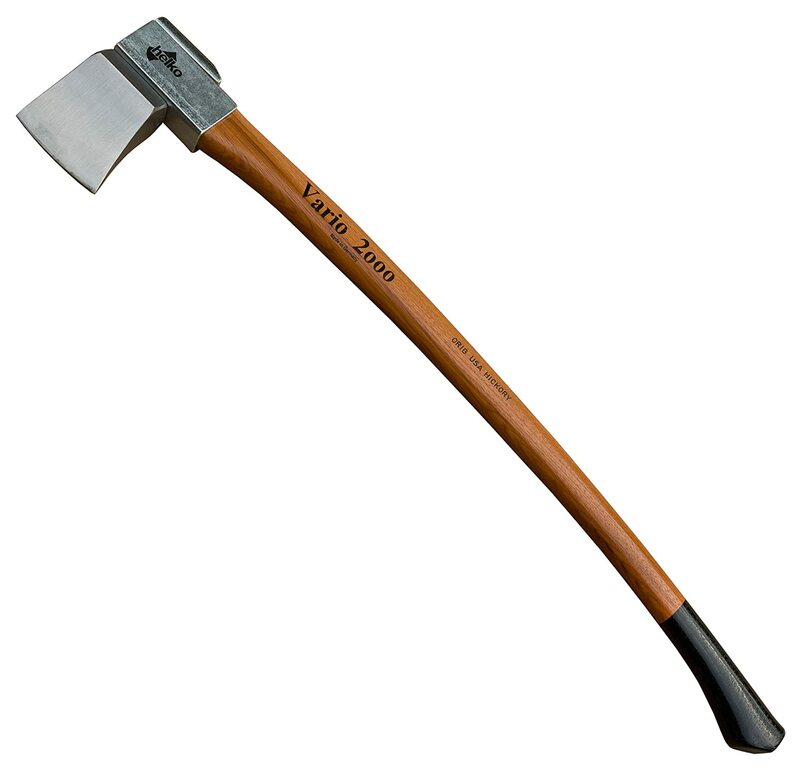 This is the massive, heavy-hitting counterpart to the Helko Woodworker Axe. With a 36-inch handle, this axe is essentially a guillotine for the poor chunks of wood you’ll be splitting. Might want to put an anvil under those logs just in case. Have you considered taking up weightlifting? I’m just saying; it’s probably a good idea if you want to wield this behemoth. Additionally, the Vario 2000 series comes with exchangeable heads and handles so you can keep your axe in working condition even once parts of it give in, which should take a long time anyway. There’s a safety feature included that prevents the head from flying off, which is great because, with an axe of this power, such an accident would be even more dangerous. If you can handle the sheer size and weight of this tool, you’ll be pleased to know it comes with a protective sheath (does an unstoppable object need protection?) and some Axe-Guard, so if you have to bust through a bunker using this axe, you can use those extra features. 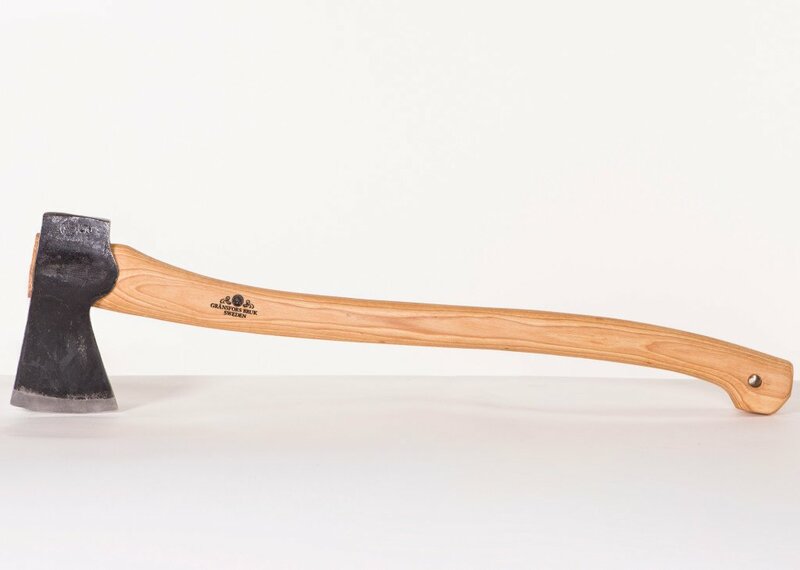 Unless you’re really tall, or you’re the Hulk, the best purchase will probably be the #4 Gransfors Burks Scandinavian Forest Axe. It offers enough versatility that you can always find a use for it and lasts long enough to make its money back tenfold if your job involves splitting or felling. If you want something more powerful, the #3 Estwing E45A is the ideal choice, as it’s an incredibly durable axe that comes as one piece of steel, so the head can’t come off and cause damage to you or your surroundings. It’s also easy on your hands! Let us know if you have experience with any of these axes. We’d love to hear your feedback and your stories, so feel free to post a comment! Very informative article. My favorite ax is the Fiskars X27 Super Splitting Axe.Is this good for wood cutting?